A residential block with development potential in the affluent Brisbane suburb of Bardon will go under the hammer on Friday, 24 November through Ray White Special Projects. 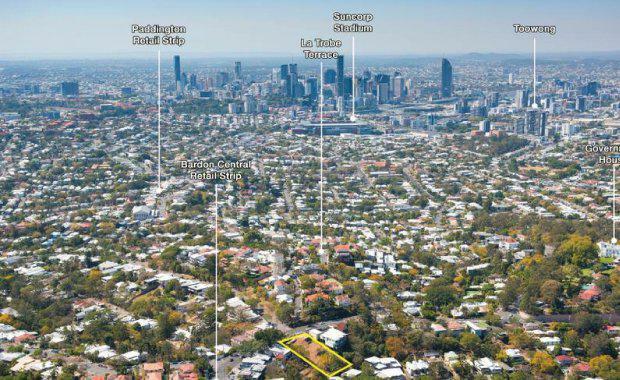 The sale of the cleared site at 34 MacGregor Terrace, Bardon, is on behalf of the Queensland government. Zoned LMR2 (Low-Medium Density Residential), the 1127 square metre parcel is 5km west of the Brisbane CBD. Ray White Special Projects (Queensland) associate director Andrew Burke says the zoning allows for a mix of two and three-storey buildings. “Because of the elevated position, the site has a spectacular mountain outlook,” Burke says. The suburb of Bardon has predominantly character, low-density housing, and Burke says high-end residential development is in demand. Brisbane Transport bus services, including the high-frequency City Glider, service the area. A small shopping centre comprising a pharmacy, bakery, bottle shop, beautician and cafes are located on MacGregor Terrace, just 75 metres from the property. Popular public and private schools, such as Ithaca Creek State School, St Joseph’s Catholic Primary School, Mater Dei Primary School and Mt St Michael’s College, are also close by. “Other extensive amenity is at nearby Given Terrace, Paddington,” Burke said. The property at 34 MacGregor Terrace, Bardon, will be auctioned at 10:30am (Queensland time) on Friday, 24 November 2017. The Urban Developer is proud to partner with Ray White Commercial to deliver this article to you. In doing so, we can continue to publish our free daily news, information, insights and opinion to you, our valued readers.